Aliens and immigration — Admission, immigrants — Application for admission — Immigrant visa, place of application. This was an application for judicial review of a dismissal of an application for permission to seek landed immigrant status from within Canada. The applicant, Thillaiampalam, was a Tamil citizen of Sri Lanka. Thillaiampalam had previously applied for Convention refugee status. His application was denied. Thillaiampalam’s son was subsequently granted Convention refugee status. The respondent Minister of Citizenship and Immigration found that it was in the son’s best interest to remain in Canada with Thillaiampalam. Thillaiampalam was the only member of the son’s immediate family in Canada. HELD: The application was granted. The dismissal was set aside. The matter was referred back to the Minister for redetermination. The Minister did not consider the importance of having Thillaiampalam remain with the son. There were sufficient humanitarian grounds to allow Thillaiampalam to apply for landed immigrant status from within Canada. David Tyndale, for the respondent. GIBSON J. 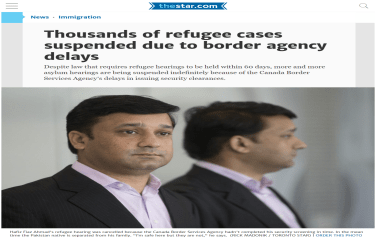 (Reasons for Order):— These reasons arise out of an application for judicial review of a decision of an Immigration Officer (the “Officer”) wherein the Officer rejected an application on behalf of the applicant for permission to seek landed immigrant status from within Canada on humanitarian and compassionate grounds. The decision in question is dated the 30th of October, 1996. The applicant is a Tamil citizen of Sri Lanka. He arrived in Canada on the 21st of February, 1990. He was denied Convention refugee status. An application to seek judicial review of that decision was denied. His application to be designated a member of the Deferred Removal Order Class (“D.R.O.C.”) was refused as his application was filed late. The applicant filed his application for leave to apply for landing from within Canada on the 9th of April, 1996. He was interviewed, with the aid of an interpreter but without the presence of counsel, on the 24th of October, 1996. He was invited to provide an application for landing on behalf of his son. He provided that material on the 29th of October. By letter dated the 30th of October, his own application for landing, as indicated above, was rejected. No reasons were given. Note 1: (1994), 170 N.R. 238 (F.C.A.). The decision itself is wholly a matter of judgment and discretion and the law gives the applicant no right to any particular outcome. In a case such as this one the applicant does not have a “case to meet” of which he must be given notice; rather it is for him to persuade the decision-maker that he should be given exceptional treatment and exempted from the general requirements of the law. Note 2: April 11, 1997, Court file A-855-96 (unreported) (F.C.A.) (application for leave to appeal to the Supreme Court of Canada filed June 10, 1997). What has been recognized is that where a discretionary tribunal decision is either, on its face, perverse, or where there is evidence of facts before the tribunal which manifestly required a different result or which were irrelevant yet apparently determinative of the result, then a court may be obliged to conclude that, in the absence of reasons which might have explained how the result is indeed rational or how certain factors were taken into account but rejected, the decision should be set aside for one of the established grounds for judicial review such as error of law, bad faith, consideration of irrelevant factors, failure to consider relevant factors, etc,…. Here, counsel for the applicant urged before me that the decision of the Officer is either, on its face, perverse, or there were facts before the Officer which manifestly required a different result. Evidence was before the Officer regarding the grant of Convention refugee status to the applicant’s son and the reasons of the CRDD indicating that, given the son’s Convention refugee status as against Sri Lanka, the best interest of the son would be served if he were here with his father in Canada. The tribunal record indicates that the Officer acknowledged the presence of the son in Canada and the son’s Convention refugee status. The significance of these factors appears to have been overlooked. The son’s only member of his nuclear family in Canada is his father, the applicant. Further, the young son has only been in Canada for a very limited period of time. The fact that the son also has an uncle in Canada with whom he and his father live, appears to have been given more weight by the Officer than was given to the importance of the father and son being together. Clearly, given the son’s Convention refugee status, return by him with his father to Sri Lanka is not an option. The Officer errs in determining, on the basis on the material before her, that the applicant has been dependant on welfare since 1994. The evidence simply does not support such a conclusion. The Officer acknowledges that the applicant lost his opportunity to apply for landed status under DROC because his application was late-filed. She appears to fail to give any consideration to the fact that the applicant may well have been seriously prejudiced as a result, despite the fact that the late-filing was entirely the fault of the Applicant’s former solicitor as was acknowledged by the solicitor himself. The Officer concludes the applicant does not speak English despite the fact that, in his application for landing from within Canada, the applicant indicates he speaks, reads, and writes English. It is true that the applicant chose to attend his interview with a translator so that he could participate in the interview in his native language but this is surely not determinative of the applicant’s skill in English. It might well be nothing more than an indicator of the nervousness of the applicant in approaching the interview, given the implications for his future and that of his son, and therefore of his desire to put his best foot forward in the language in which he is most comfortable. Based on the foregoing considerations, I conclude that in the terms of the Williams decision quoted above, the Officer’s decision is either, on its face, perverse, or there were facts before the Officer which manifestly required a different result. In the absence of reasons which might have explained how the result arrived at by the Officer was indeed rational or how certain factors were taken into account but rejected, I conclude that I must set aside the decision of the Officer for failure to consider relevant factors. That is not to say that the decision reached by the Officer might not have been reasonably open, but in the absence of reasons that would disclose why the decision is reasonably open, I feel compelled to conclude that it was not. Counsel for the applicant urged a second ground for review of the Officer’s decision, that being, that the Officer apparently did not consider whether or not it was open to her to extend the time within which the applicant’s DROC application could be filed. The short answer to this argument is that the issue of reopening the DROC application time limit was not directly before this officer. Thus, this application cannot succeed on that ground. For the foregoing reasons, this application for judicial review will be allowed, the decision of the Officer not to recommend processing of the applicant’s application for landing from within Canada will be set aside and the matter will be referred back to the respondent for redetermination by a different officer. Counsel for the applicant recommended certification of a question regarding extension of the time limit for filing the applicant’s DROC application. Since any such question would not be determinative of this application for judicial review, no such question will be certified. Counsel for the respondent recommended against certification of a question. No question will be certified.